Teargas and gunshots have on Monday morning rocked parts of Kampala City as Police battled to disperse protestors attempting to take part in the Walk to walk demonstrations. Many shops have remained closed in the Central Business District following the disturbances. Witnesses say the Police action was prompted by protestors who blocked traffic on Kyaggwe Road and Kisekka Market Road while throwing stones at passerby motorists. By 9.30am, despite the Police assurance that the situation had normalized, shops remained closed in Kisekka Market, at Equotorial Shopping Arcade, and other shops while protestors are still pelting stones to security personnel. Witnesses at the scene say the Military Police and other security agencies have been heavily deployed and are patrolling the streets amidst taunts from the protestors standing on the closed shops. “The situation here is tense; people are throwing stones continuously at the security personnel and cars passing. There is a lot of noise and hooting,” said a witness. The incident come as the planned walk to work protests resume despite Police warning people to desist from participating. At Kanyanya, Gayaza Road, Police mounted a road block slowing the flow of traffic prompting exchanges between motorists, their passengers and the Police. Dr Besigye was by 9am addressing an FDC meeting at Rider Hotel, Seeta, Mukono amidst heavy deployment of security operatives around the hotel. 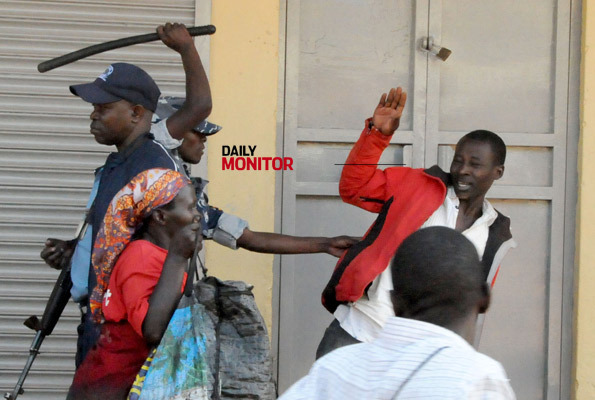 Walk to work: Teargas, gunshots rock downtown Kampala – National |monitor.co.ug.